The recent devastation brought on by hurricanes in the U.S. and Puerto Rico has led to renewed conversations about the impact of climate change. Dangerous storms, rising sea levels, droughts, and heat waves are now more commonplace around the globe, and for better or for worse, there are many companies poised to cash in. Few companies will explicitly try to profit off climate change, but there are a number of industries that could see revenues rise if our planet continues to warm. Whether by harnessing new energy sources, building new infrastructure, or creating products to protect people's health, companies will step up and respond as our climate changes. Meanwhile, other firms will profit in unexpected ways. 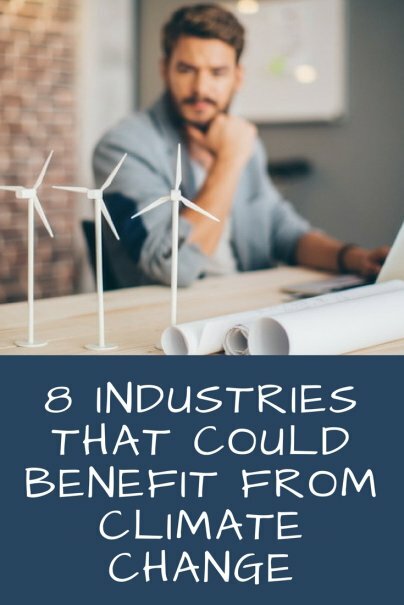 Here are some major industries that may benefit — rightly or wrongly — from climate change. Most scientists agree that the pace of global warming can be slowed by a shift toward green energy. Companies that produce solar energy and electricity from wind and other nonpolluting sources should see revenues grow as the energy economy shifts. The number of startups operating in this area is expected to increase, too. Here's why. Renewable energy sources comprised about 15 percent of U.S. electricity production in 2016, and that's likely to increase. According to the Solar Energy Industries Association, solar energy accounted for 30 percent of all new sources of electricity in the first quarter of 2017. Renewable energy is expected to pass coal as an energy source within the next 12 years. We won't be switching entirely to green energy overnight, but the megawatts produced by environmentally friendly sources will continue to increase. While concern over climate change has led to a push for more renewable energy sources, traditional energy companies aren't going away tomorrow. In fact, as energy needs increase due to rising temperatures, it (ironically) may be established fossil fuel companies that meet those needs until renewable sources become more abundant and reliable. Some companies have also noted that melting ice in the Arctic could open up more areas for offshore oil drilling. While many people are focused on preventing and slowing climate change, others are examining how to make our world more resilient to deal with the impacts. This means potentially building sea walls and other infrastructure to address rising sea levels. It could also mean bolstering major infrastructure such as railways, airports, and roads. Much of this work will be done by private companies, and could come sooner rather than later if lawmakers agree on a large increase in infrastructure spending. Companies such as Caterpillar, Bechtel, and Whiting-Turner are among those often involved in major construction projects. It's worth pointing out that many of these same companies are active in disaster relief efforts, as well. An increasing number of places in the world, including some densely populated regions, are dealing with temperatures that are virtually deadly unless citizens have access to air conditioning. This presents a huge opportunity for air conditioning suppliers such as Daikin Global and Fujitsu, provided that their potential customers have access to the electricity to run AC units. Of course, air conditioning is also a contributor to climate change due to the use of hydrofluorocarbons, which trap thousands of time more heat in the atmosphere than carbon dioxide. As countries move to phase out the use of HFCs, companies that produce affordable and scalable air conditioning solutions that are better for the environment are the best poised to cash in. If an increasing number of people are facing extreme weather, that's an opportunity for clothing manufacturers who use technology to produce clothing that helps keep us safe and comfortable. Think of specialized apparel and gear that's designed to keep you cooler, block out the sun, protect against extreme rainfall, or respond to changes in temperature. Even sunglasses may become more technologically advanced. Climate change also presents an opportunity for companies committed to reducing their carbon footprints when sourcing and manufacturing their products. In August, a Russian tanker ship made headlines by becoming the first ship to cross the Northeast Passage from Europe to Asia without the use of an icebreaker. This is significant, because it suggests that companies can now ship goods much faster. For example, a trip through the Northeast Passage, which runs along the Arctic coast of Russia between the Atlantic and Pacific Oceans, takes 30 percent less time than the traditional route through the Suez Canal. The trip by the Russian tanker was made possible due to declining ice levels in the Arctic, presumably as a result of climate change. The reduction in ice could also mean more potential routes for vacation cruise ships, including more trips to the Arctic and Antarctic regions. There is increasing concern that food shortages and other challenges caused by climate change could lead to civil unrest. In fact, the United Nations Food Programme last year said high food prices led to unrest in Morocco, Bangladesh, Tunisia, and Indonesia. Large defense companies, including Lockheed Martin, Raytheon, and United Technologies, would indirectly profit if tensions escalated into armed conflicts, and many of those same companies are involved in carrying out the delivery of humanitarian aid. Moreover, climate change is often cited as a contributing factor to the refugee crisis in Syria and other parts of the Middle East. Continued mass migration could mean a greater need for border surveillance and security forces, which would also benefit security and defense firms. A number of forces are combining to drive prospects for crop science companies. The world's growing population is causing food demand to rise. Meanwhile, consumers are showing more interest in organic food products. This is all happening at a time when climate change is causing more droughts, floods, and unpredictable growing conditions. Companies that may benefit from these trends include new biotech firms, as well as established giants such as Monsanto and Bayer, which have invested billions of dollars in crops designed to be more resilient and produce higher yields with less water and soil.